Le Puglie (from Latin “la Pulcher” – the beautiful) extends along the Adriatic Coast from the Gargano peninsula (the boot's spur) down to Lecce (the heel). Central Puglia between Bari and Trani is particularly versatile and rich in history. Remains of the opulent Staufer period can be found everywhere. Bari once competed with Venice and Naples for supremacy in Italy. And on the fringes of Alta Murgia National park stands the mysterious castle of the Emperor Frederick II. Around 1100 AD, the mighty lake towns of Italy all had their saints. Venice had Markus, Naples boasted Januarius (an early Christian martyr), Genoa had John the Baptist and Salerno the Evangelists Matthew. Only Bari was left empty-handed. So the merchants of the city commissioned a band of pirates to rob the bones of St. Nicholas of Myra in modern day Turkey. On May 7, 1087, the pirate ship landed with the sarcophagus in the port of Bari. The precious relic initiated a real influx of pilgrims. At a stroke, Bari had become one of the main pilgrimage destinations in Europe. 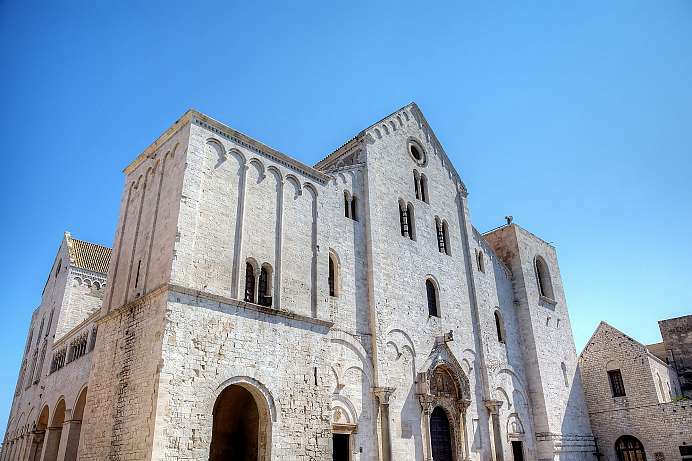 With the money from the pilgrims a great church was built, which became the epitome of the Apulian Romanesque. After taking over a hundred years to be built, the Basilica of San Nicola was inaugurated in 1196. Especially her crypt, where the remains of Nicholas rest, is a wonderful place of spiritual power. 26 ancient columns bear the mystical space, some of them decorated with beasts and grimaces. This unique medieval castle was designed by the German emperor Frederick II in the 13th century. The “crown of Pulia” is situated on a hill and can be seen from far away. The symbolic significance of the structure is reflected in the location, the mathematical and astronomical precision of the layout and the perfectly regular, octagonal shape. 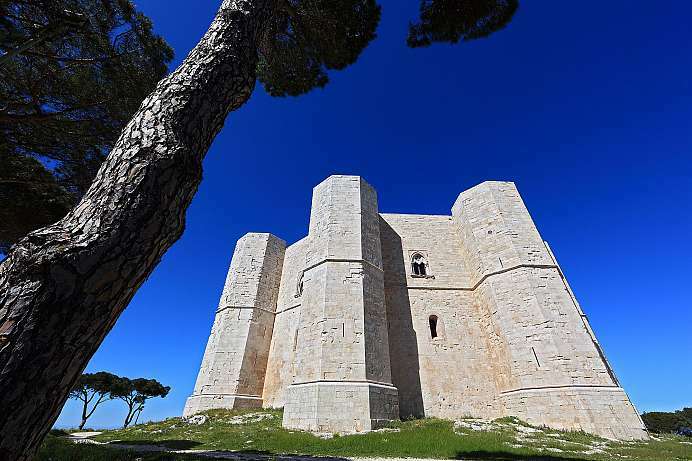 Castel del Monte is considered a successful blend of elements from classical antiquity, the Islamic Orient and north European Cistercian Gothic. The reason for the unusual shape of the fortress remains a mystery, although theories abound (most of an astronomical or religious nature). Castel del Monte was declared a World Heritage Site in 1996 and is open to the public all day in the summer and mornings in the winter. Castle of the Staufer Emperor Frederick II. 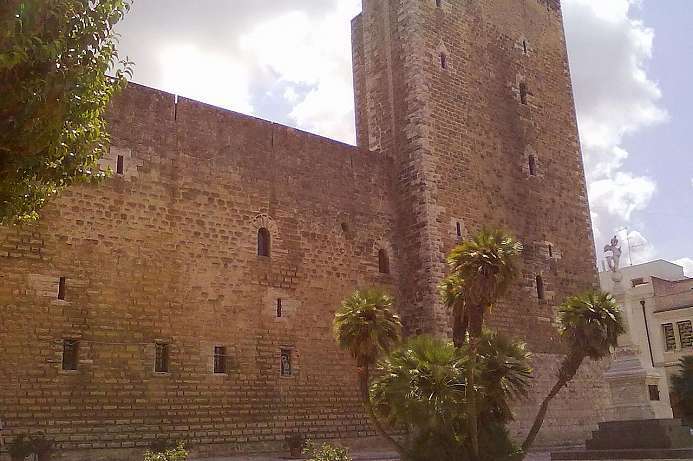 The castle was built around 1230 by Staufer Emperor Frederick II., who spent most of his life in Sicily and Puglia leaving behind many buildings. Gioia del Colle is one of the best preserved castles. 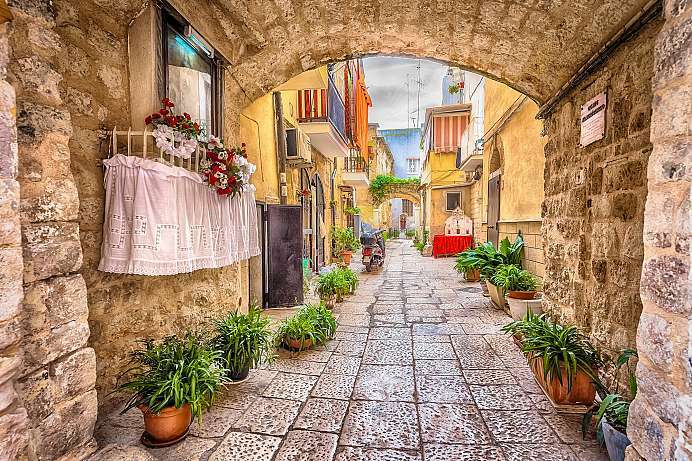 The old town is a medieval maze of alleys and stairways, enchanted places and secluded backyards, churches and pre-Christian relics. A walk through the Centro Storico leads to traces of Arabs and Normans, and also especially to the German emperor, Frederick II, under whose reign Bari experienced an unparalleled upturn. Even to-day Bari looks archaic and has a Southern Italian atmosphere. Clothes lines hang above the streets. Business acumen and cosmopolitanism can be found right next to poverty and crime. 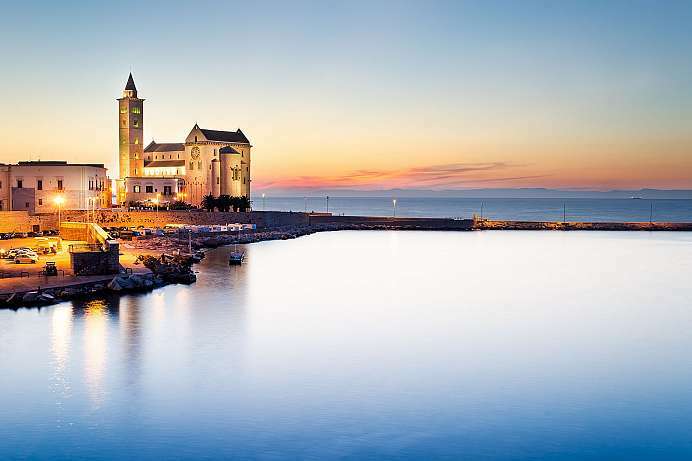 Trani (55,000 inhabitants) is one of the most remarkable cities of Puglia and is located on a headland with its medieval side facing the sea. High above the waters stands the Norman-Staufer Basilica dating back to the 12th century. Because of its geometrical clarity it is often compared to Castel del Monte, the nearby residence of Emperor Friedrich Barbarossa. From Trani one can explore the peninsula of Gargano to the north (spur of the boot) with its unique beauty now protected by a nature reserve.